From the time your child is born they receive medical attention, so it’s easy to develop a schedule for regularly visiting the doctor. Establishing when your child should visit the dentist on the other hand, may not be as clear. Your child should have their first dental appointment shortly after their first tooth erupts, or around their first birthday. Once you have teeth, you need to start caring for them. Children’s dental visits present an opportunity for a dental professional to administer both general and preventive care for your little one’s teeth. The list of services that your children’s dentist provides is important, but equally important is the care environment at the practice. 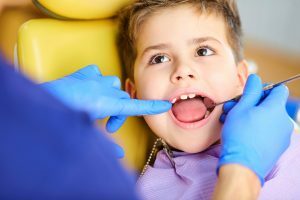 During your children’s formative years, they can have experiences that shape the way they view going to the dentist for the rest of their lives. A positive, welcoming environment for your kids is key. When your children feel good about attending dentist appointments, they’ll be more likely to follow through with them as an adult. That leads to a lifetime of strong oral health. The list of general dentistry services that your child needs matches many of the services that adults need. Your child needs a teeth cleaning to remove any plaque or tartar buildup (especially at ages when brushing may not be easy). Your child also needs an examination from the dentist. This part of the visit allows a professional to evaluate the state of your child’s teeth. Catching a problem as it develops can mean fewer cavities and fewer visits. Preventive care is always the best option for any investment, and your child’s teeth are an investment. The habits formed and overall state of your little one’s teeth now can impact their oral health future. Preventive treatments help secure that future. Dental sealants are a popular option, especially for hard-to-reach teeth. Your dentist can place a sealant (a thin sheet of biocompatible acrylic) to the chewing surfaces of teeth. This prevents bacteria from building up on these surfaces and causing cavities. Fluoride treatment is another popular option to fortify teeth as they grow in. Cedar Dental prides itself on its welcoming, child-friendly environment. Establishing strong oral healthcare habits at a young age helps your child take ownership of their health and continue to care for their teeth as an adult. If you need general and preventive children’s dentistry services for your little one, Cedar is here to help. To make an appointment for your child, or anyone in the family, contact Cedar Dental in Cedar Rapids, IA at 319-364-7108.